Sweaters are a little harder to care for than most garments. They can shrink; they can stretch; they can pill. And the softer the sweater, the more delicate it is. 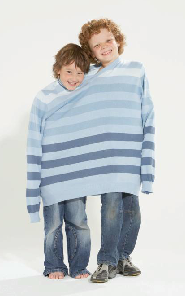 Many sweaters can survive the laundering process – and even come out looking good. You just have to know how to launder each type of fiber. First: Always read the label and follow the instructions very, very carefully. If it says, “Dry Clean Only,” dry clean it. However, if it says “Dry Clean,” you may be able to wash it. And if the label says, “Wash in cool water,” don’t wash it in cold water – there is a difference. Washing: Always turn sweaters inside out to reduce pilling. Wash in extra-large mesh bags. If hand washing, remove excess moisture by rolling the sweater in a towel. Machine drying: Not recommended but if you do put your sweater in the dryer, dry on low heat and remove when almost dry, reshape finish drying flat on a rack. Acrylic: Can stretch when subjected to heat. Wash as directed on the label (usually in warm water). Lay flat to dry or tumble dry on low if the label says it’s OK.
Angora: A rabbit hair blend that is very prone to shrinking – consider dry cleaning. If the label says it can be washed, hand-wash only with a gentle product such as Woolite or any baby liquid laundry detergent. Lay flat to dry. Cashmere: Goat hair blended with wool or synthetic fibers. Again, go by the label instructions. Usually, you can wash cashmere on the delicate cycle in cold water. Roll in a towel to squeeze out excess water, reshape and dry flat. Chenille: Chenille sweaters lose their soft, silky feel when put in the washing machine – even if the label says it’s OK. The rubbing caused by the machine agitation can damage the fibers and make them snag or feel rough. Instead, hand-wash inside out and lay flat to dry. Cotton: Prone to shrinkage, you can usually hand or machine wash cotton sweaters in cool water. Reshape and lay flat to dry. Turn inside out to iron if needed. Silk: Some silk sweaters can be washed in the delicate cycle in cold water and flat dried, but may need ironing afterward. Wool: Some wool sweaters can be washed; others cannot. Check the label – wool is also very prone to shrinkage. If you do put wool in the washing machine, use the gentlest cycle and wash in cool water. Don’t twist. Lay flat to dry. As always, check the care labels and when necessary, bring your sweaters to your Lapels Dry Cleaner for the professional care they need to stay looking good for years to come.